The histories we write say as much about our own times as about those we study. The current polarization in Washington has prompted a nostalgia for parties that were less ideologically uniform and more prone to compromise. Fashionable “pragmatism” has similarly infected thinking about foreign policy, as the fallout from the Iraq war lingers in the air a decade on. Unnamed Pentagon sources doomsay any proposed use of American force (but don’t you try to cut their budget! ), while the left, tinged by guilt over its decades-long estrangement from the services, holds up medal-bearing military realists as paragons of wisdom. These conditions have combined to inspire a rehabilitation of Dwight Eisenhower. Indeed, every few years another fat biography tries to do for Eisenhower what David McCullough did for Harry Truman and Edmund Morris did for Theodore Roosevelt—that is, to canonize him. Geoffrey Perret’s 685-page Eisenhower (1999), Carlo D’Este’s 848-page Eisenhower: A Soldier’s Life (2002), Michael Korda’s 779-page Ike (2007), Jim Newton’s 451-page Eisenhower: The White House Years (2011)—all were well-researched, well-written, and utterly worshipful. Those big books were not the first attempts to erase the old cartoon image of Ike that a generation grew up with—the slightly daffy, avuncular, golf-loving, TV-dinner-eating, cowboy-novel-reading placeholder president. Eisenhower makeovers actually began in the 1970s, the era of “Happy Days” and Grease and post-1960s tristesse. Back then, Richard Nixon’s abuses of power made Ike’s conservatism look good by contrast, as would George Bush’s overreaching in our day. Vietnam put a new glow on Eisenhower’s diplomatic realism, as Iraq would a generation later. The first wave of pro-Eisenhower books was capped by a two-volume biography by Stephen E. Ambrose, a diligent compiler rather than a thinker or an analyst. Ambrose’s credibility was in his final years tarnished by disclosures of wild plagiarism—and then demolished entirely by the news that he had fabricated interviews with Eisenhower. Yet his work, shot through as it was with an unalloyed reverence for the military, was influential, and nowadays Eisenhower fares well in pseudo-scientific presidential rankings. Astonishingly, he is even being honored with a Frank Gehry-designed memorial on the National Mall, implying a greatness equal to that of Washington, Jefferson, Lincoln, and Franklin Roosevelt. For some reason, though, each new Eisenhower biographer still feels compelled to plead the revisionist case. This year’s contender is Jean Edward Smith, whose book is a perfectly decent and in some places exceptional introduction to his subject’s life. Smith is thorough in his research, measured (most of the time) in his judgments, and crisp in his prose style. Except for a 290-page slog through World War II, which at times feels like the Battle of the Bulge, the narrative moves briskly. It is unfortunate, then, that when it comes to Eisenhower’s White House years, Smith can muster only relentlessly positive evaluations. It is true that Ike deserves better than the condescension he once endured, but all this cheerleading for his presidency also serves him ill. Worse, the new Ikeophilia reinforces a regrettable popular attitude toward presidential power—an overwrought fear of executive activism, a naïvely roseate view of Eisenhower’s hallmark traits of realism and restraint, and an unwarranted tolerance of high-level deception. DAVID DWIGHT EISENHOWER—his mother, calling him Dwight, reversed the names from the beginning—was born in Denison, Texas in 1890. His father, a failed storekeeper and sometime drifter, was working as an engine wiper for the railroad, earning a pittance. The family soon moved to Kansas, where the elder Eisenhower took a better-paying job at his father’s creamery. Raised alongside six brothers in a religious household, Ike, as he was called even then, did well in school; his classmates predicted that he would become a history professor at Yale. His friend Swede Hazlett, who was bound for the Naval Academy at Annapolis, opened his eyes to the military colleges, and Eisenhower wound up at West Point. He excelled there socially and athletically, though not in the classroom, graduating in the middle third of his cohort. Smith dwells on Eisenhower’s political and social dexterity—his amiability, his savvy, his ability to get ahead. Even in his college days, everyone liked Ike. He harnessed his ingratiating manner to a soaring ambition. As Smith engagingly recounts, Eisenhower attached himself to a series of influential military men, from John J. Pershing, the hero of World War I (Ike assisted him in writing his memoirs), to George C. Marshall. These men hastened his rise through the ranks, often saving him from dead-end assignments. But in each job he duly earned his promotions, working hard, performing well, and garnering from his supervisors, as Smith writes, “an uninterrupted string of ‘superior’ ratings in jobs of increasing complexity.” Along with his mastery of the military’s intricacies, Eisenhower displayed what Smith calls an “unusual ability to think like his superiors”—intuiting how they would want a job done and doing just that. After Pearl Harbor, fortune—and the top brass—again smiled, landing him first in George Marshall’s Washington office as a newly minted general and then, just ten weeks after another promotion to major general, in charge of the European theater. He had leapfrogged 228 other generals. Though appreciative of Eisenhower’s wartime leadership, Smith does not sugarcoat it. Particularly damning is his account of Ike’s cover-up of his friend General George Patton’s abusive behavior toward his soldiers. Twice in August 1943, following the liberation of Sicily, Patton visited military hospitals and erupted on finding men who he thought looked perfectly healthy. One he slapped and called a coward; the other he struck violently after brandishing a pistol and shouting murderous threats. Eisenhower ordered the brash general to apologize, but he considered Patton indispensable and so he suppressed the incident. Three months later the muckraking journalist Drew Pearson exposed it, to Ike’s chagrin. Under fire, Eisenhower was in turn saved by Marshall and War Secretary Henry Stimson. Smith is also less than fawning in judging Ike’s military decisions. Eisenhower has never been considered a brilliant battlefield commander. Smith does not go so far as to endorse the bitter verdict of Field Marshal Bernard Montgomery, Ike’s British counterpart and rival, who denigrated Eisenhower as “out of his depth” in “trying to run the land battle himself,” and for having “neglected his real job on the highest level.” But he is quite harsh about Ike’s performance at a number of junctures in the war, notably the North Africa campaign of 1943. Overall he accepts the standard view that Eisenhower was no tactical genius. In Smith’s view, the general’s talents lay in politics. During the war he again won the confidence of those in charge, notably Franklin Roosevelt. In Cairo, FDR, on learning that Eisenhower craved the Legion of Merit—far from the army’s highest award, but one he had never won—surprised his general by awarding the badge to him personally, moving Ike to tears. (Roosevelt also came home from the Tehran conference in 1943 gossiping giddily about Eisenhower’s affair with his driver, Kay Summersby—a subject on which Smith dilates extensively.) But Ike’s political aptitude extended well beyond currying favor with his superiors. When Roosevelt, having chosen to work with France’s collaborationist Vichy regime, forbade Eisenhower from dealing with Charles de Gaulle and the London-based resistance except on strictly military matters, Ike nonetheless forged a bond with the exile leader and helped stage-manage his triumphant return to France in June 1944. This coup ensured de Gaulle’s leadership of the new provisional French government—a decision with consequences for postwar Europe. And despite this end-run, Eisenhower continued to count Roosevelt among his enthusiasts. So well liked was Eisenhower that his name was spontaneously floated for president in 1948. Republicans were not the only ones who wanted him; so did a gang of Democratic leaders, ranging from Chester Bowles and Hubert Humphrey to Lister Hill and Strom Thurmond, who tried to organize a caucus in Philadelphia two days before their own convention to “find the ablest and strongest man available” to lead their party. If this insurrection offended Harry Truman—who very much expected the nomination himself—he didn’t blame Ike. As late as November 1951, Truman told Eisenhower that if the general would accept the Democratic Party’s nomination in 1952, he would forgo another term. Ike, while supporting Truman’s foreign policy, thought the Democrats too liberal on domestic affairs and declined. SMITH’S LONG exposition of Eisenhower’s pre-presidential career, including his brief presidency of Columbia University and his service as supreme Allied commander in Europe, ends up shortchanging the White House years. There is little or no mention in the book of many burning issues of the day, such as the execution of the Rosenbergs, the Montgomery bus boycott, the culture wars over religious freedom, the black migration to the Northern cities, and the spread of urban poverty and social distress that John Kenneth Galbraith and Michael Harrington would soon decry. The topics that receive attention tend to be Ike’s finer hours, at least in Smith’s estimation. In discussing Eisenhower’s presidency, Smith abandons his previous detachment and assumes the role of advocate, intruding on his narrative to beat back criticisms. Elsewhere in the book he is measured, but here Smith’s tone turns defensive and lawyerly, as when he writes that “those who would criticize Eisenhower for not moving fast enough on civil rights”—one area where the case for Eisenhower’s wisdom remains weak—“should remember that it was his judicial nominees who made the revolution possible.” Earl Warren, whom Ike named chief justice of the United States to fulfill a campaign pledge, obviously deserves acclaim for conjuring a unanimous decision in Brown v. Board of Education; but to regard the Supreme Court as the driving force in the fight for racial equality slights the workaday heroism of the rank-and-file members of the civil rights movement, to say nothing of men like Thurgood Marshall and A. Philip Randolph who were at work well before Brown. In these chapters, Eisenhower the political animal gives way to a less complex, almost marmoreal statesman: a man—a type—imbued by the American heartland with a granite integrity, and by his years of service with a soldier’s code of honor. The special pleading leads Smith into untenably broad claims. “Eisenhower gave the nation eight years of peace and prosperity,” he asserts. “No other president in the twentieth century can make that claim.” That is a strange sentence, for several reasons. It suggests that Ike somehow pulled off something that other presidents could not manage; but many presidents of equal or greater achievement did not serve a full eight years (TR, Truman) or did not happen to hold office amid a humming economy or a period of quiet abroad (Wilson, FDR). More important, the claim is not even true: there was a recession in 1953–1954 and another in 1957–1958, which was considered the worst downturn of the postwar era until the 1970s. And militarily, while Ike never initiated full-scale hostilities with another nation, the description of the Cold War, then at its most menacing, as a time of peace induces some cognitive dissonance. (It recalls Margaret Thatcher’s glib remark that the West won the Cold War without a shot being fired—a statement that surely confused the people of Korea, Angola, Nicaragua, and other sites of proxy wars.) Indeed, despite Ike’s realist posture on national security, the United States on his watch interfered in Iran, Guatemala, Lebanon, and Vietnam. Eisenhower also approved the invasion of Cuba, as John F. Kennedy rudely learned, though Fidel Castro’s name does not appear in Smith’s book. None of this is to deny Eisenhower’s genuine achievements. Perhaps the most under-appreciated of them (at least today) was his discomfiture of the America First wing of his party. By defeating Robert Taft, an isolationist stalwart, for the Republican nomination in 1952, Eisenhower brought his party into the modern age. But the battle was not quite over, as he learned when another Ohio senator, John Bricker, mobilized to amend the Constitution to curtail the president’s treaty-making power. The Bricker amendment—a backlash against Roosevelt’s wartime deals with Stalin and the various postwar United Nations treaties—had enormous popular support. After hoping in vain to snuff it out quietly, Eisenhower eventually realized that he had to oppose it publicly, which he did after Lucius Clay, John McCloy, Averell Harriman, and a bipartisan team of worthies went first. It fell to the Senate minority leader Lyndon Johnson to bury the amendment, which he did through his back-pocket legislative magic, pulling it off only after rousting a drunken Senator Harley Kilgore of West Virginia just in time to break a critical tie vote. Smith also praises Eisenhower amply, as have previous biographers, for not going after the safety-net programs created by Roosevelt and Truman, as conservatives wanted to do at the time (and many now wish to do again). Ike worked amicably with LBJ and House minority leader Sam Rayburn to preserve and even at times to enlarge the New Deal state—especially once the Republicans lost control of Congress in the 1954 midterm elections and the pair of Texas Democrats became majority leader and speaker. Together they expanded Social Security to cover tens of millions among the self-employed, created (at the president’s instigation) the interstate highway system, and built the St. Lawrence Seaway, opening the American heartland to seafaring commerce. Ike called it Modern Republicanism. Academics called it the liberal consensus. EISENHOWER’S transformation of the GOP into an internationalist party and his respectable list of domestic feats should rescue him from ridicule. But like many revisionists, Smith goes too far. He seeks by sleight of hand to transmute Eisenhower’s failings into triumphs and to put a positive spin on the negatives. Most disappointingly, he follows others in treating Eisenhower’s instincts toward caution and restraint, rightly criticized at the time as shortcomings in an office that requires bold leadership, as virtues of the highest order. Greenstein was writing as neither a biographer nor a historian. He is a political scientist. His book sought not so much to illuminate Ike’s life and times as to advance a theory of leadership—an inherently fuzzy business. As political science is sometimes wont to do, his book presented banalities or tautologies as if they were conclusions of import. “Eisenhower ran organizations by deliberately making simultaneous use of both formal and informal organization.” To which Arthur Schlesinger quipped, “One must ask: who does not?” Historians found fault. Greenstein, as James T. Patterson noted, was “highly selective in his use of evidence,” marshaling support for what could seem like preconceived conclusions. A related problem was more debilitating: by stripping his individual cases of Eisenhower’s “leadership” from their context, the book gave a skewed picture of the historical issues involved. These last two methodological flaws converged in Greenstein’s bizarre claim that Eisenhower, far from allowing himself to be bullied by Senator Joseph McCarthy and other congressional Red-baiters, in fact worked surreptitiously to neuter them. By ducking a direct confrontation with McCarthy and instead deputizing Vice President Richard Nixon and others to do his dirty work, Eisenhower supposedly deprived McCarthy of the dignity of a presidential response, thereby allowing him to self-destruct. The argument, as unconvincing coming from Smith as it was from Greenstein, fails on many levels. Was Ike’s decision to fight back against McCarthy after the senator targeted the army in late 1953 part of a consistent plan, or was it just a change of heart when the attacks hit too close to home? Even if it were the former, it is not clear why this reticence deserves to be called strategy instead of timidity. Eisenhower could not have known how long his silence would have to last before McCarthy overreached; and in the meantime he nonchalantly abided much wickedness that the president of the United States—especially one of his stature and prestige—should not have abided. This included opportunistically excising from a campaign speech in 1952 a defense of his mentor George Marshall, whom McCarthy had recently slandered as a Commie symp. More important—and again, Smith fails as much as Greenstein to consider the broader picture—the tight focus on how Eisenhower handled the single figure of McCarthy ignores the more significant question of how he handled the larger problem of demagogic Red-baiting that poisoned the political culture of the 1950s. The phenomenon of McCarthyism was bigger than McCarthy, and it continued after the senator’s downfall. But Smith, following Greenstein, says nothing about the rest of the story: how Ike permitted the suspension of Robert Oppenheimer’s security clearance, which removed the eminent scientist from General Advisory Committee to the Atomic Energy Commission; how he signed into law in 1954 the Communist Control Act, which criminalized membership in the Communist Party; how he got on with FBI director J. Edgar Hoover, who remained throughout Eisenhower’s presidency a powerful practitioner of the worst kind of anti-communism. (As late as 1958, his lurid Masters of Deceit was a best-seller.) The McCarthy set piece is replayed, but the larger problem of Eisenhower’s relationship to his own party’s Red-baiting—which does not reflect well on the president—goes unaddressed. Actually, it’s pretty easy to say that he was wrong. It was clear by 1957 that much of the white South wasn’t going to accept desegregation without a fight—a violent fight. A president’s job does include conciliating all parts of the country (“if possible”), but leniency can encourage defiance. Barack Obama is only the most recent president to learn that lofty talk of unity and sincere gestures toward compromise do not always appease an entrenched opposition, especially one that believes its way of life to be under siege. Those situations require stubborn moral force. But Eisenhower, as Smith says, eschewed the bully pulpit on civil rights—not only at Little Rock, he might have added, but on other occasions, from Emmett Till’s murder to the promotion of his own civil rights bill, many details of which, he inadvertently revealed to James Reston of The New York Times, he did not even comprehend. “I was reading part of that bill this morning and ... there were certain phrases I didn’t completely understand. So before I make any more remarks on that, I would want to talk to the attorney general and see exactly what do they mean,” he said. Or was this, too, just masterly indirection, the hidden hand at work? It is true that sometimes a president should stay above the fray and let surrogates stake out controversial positions. But the fight for African American civil rights is a perfect example of an issue that demanded the use of the bully pulpit by the president himself—that demanded moral leadership. There was little to be gained from hiding one’s hand. And little was. IF PRESSED, Eisenhower’s devotees might concede that his presidential years were indeed less noteworthy in the domestic realm than those of the men who preceded and followed him. But they would probably counter that it was in foreign policy that Eisenhower could stake his true claim to greatness. Here the hidden hand finds its correlative in a posture of realism—the avoidance of the public platform to articulate values and ideals in favor of cold strategic calculations of narrow self-interest. Today, as this realism enjoys newfound popularity, Eisenhower is commonly cast as its patron saint. Recently, for example, Thomas Powers, in praising Eisenhower in The New York Review of Books, lamented that “American presidents since Eisenhower seem to share an abiding temptation—they can’t let peace alone.” Certainly, many presidents—including Eisenhower—undertook misguided interventions. But to suggest that it was peace in Bosnia, for example, that Bill Clinton was unable to leave alone in the mid-1990s, or that it was peace in al-Qaeda’s Afghan training grounds that George W. Bush should have forced himself to tolerate, is to cease making critical distinctions. Powers goes on to contend that Eisenhower would have opposed Kennedy’s invasion of Cuba, a version of which he actually approved, as well as Johnson’s escalations in Vietnam, which Ike in fact unflinchingly supported. Indeed, as late as the 1968 presidential campaign, Eisenhower warned that any candidate urging withdrawal from Indochina “will have me to contend with,” promising a national speaking tour to quash what he considered a dangerous revival of Taftian isolationism. The unromantic truth is that on foreign policy no less than domestic issues, Eisenhower’s presidency—realist or not—was at best a mixed bag. Governing amid the Cold War tinderbox, he clearly should be thanked for averting a nuclear war—though if you are reading this from anywhere but a bunker in the Black Hills, he has to share credit with every other president since Truman. 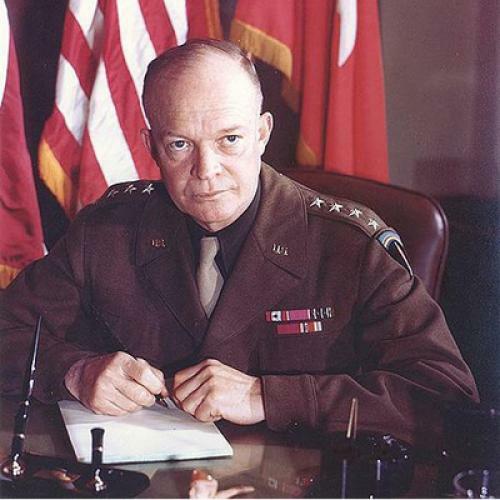 Eisenhower had successes, such as ending the Korean War (which he had initially supported), and failures, such as letting down the Hungarian rebels who were crushed by Soviet tanks in 1956. The notion that Ike’s tenure represented a high-water mark for postwar American diplomacy does not withstand scrutiny. Nostalgia for his foreign policy probably began during the Vietnam War, when it became fashionable to look back with favor on Eisenhower’s hard-headed decision to cut loose the French colonial forces making their disastrous last stand in 1954 at Dien Bien Phu, the nowinfamous garrison near the northern part of the Laotian border with Vietnam. If we had only stayed out! But how many recall that Eisenhower reached this decision only after considerable vacillation and confusion? In fact, he originally did send in bombers, mechanics, and other aid—secretly. One airman died. And it was in response to suggestions that he might let Vietnam fall to the communists that Eisenhower protested, “You have a row of dominoes set up, you knock over the first one, and what will happen to the last one is the certainty that it will go over very quickly.” When Winston Churchill balked at helping the French, Eisenhower importuned his old partner that “we failed to halt Hirohito, Mussolini, and Hitler by not acting in unity and in time.” Smith interprets Eisenhower’s shift as part of a grand plan, “typical of Ike at his best. Feint in one direction publicly, move privately in another.” That remains unclear. To be sure, he kept America from falling into the quagmire—temporarily; but in the process he formulated the Domino Theory and endorsed the Munich Analogy. All presidents conduct a good part of their diplomacy out of public view, and political strategy frequently needs to be concealed. But it is also important to realize that hidden-hand governance is at root antithetical to democracy. Smith is admirably candid in noting that Eisenhower managed to avoid hot wars because he dramatically built up America’s nuclear stockpile, which “led to the development of thermonuclear weapons, intercontinental ballistic missiles, and the spiral in defense spending that Ike had hoped to avoid” as well as the small matter of “the possibility of mutual assured annihilation.” But Ike’s New Look foreign policy depended also on another, equally problematic choice: his reliance on covert CIA operatives to topple foreign governments in Iran, Guatemala, and elsewhere. He believed that it was very much in America’s interest to shape the destinies of other nations. He just preferred to do so without the public knowing about it. This is language that belongs in a eulogy, not a biography. It also contradicts one of the qualities that elsewhere makes Smith’s book so intelligent: its recognition of Ike’s crafty political nature, his Machiavellian dimension, which does not admit of easy moral verdicts. Presidential biography, a genre that has long enjoyed popular interest, invariably gets bogged down when it devotes itself to the project of reputation-building or ranking. Arguing about whether a particular chief executive has gotten his due from historians or the public, or where he stands among the all-time presidential batting leaders, is merely a parlor game. What biographers should aspire to provide is a proper understanding of the reasons for his rise, the nature of his vision, the substance of his governance, and the relationship he had with the people he led. The reason that Eisenhower sustained high levels of popularity has nothing to do with the empty pronouncement that he knew right from wrong. A good soldier to the last, he knew not to rock the boat. He preserved New Deal programs, shunned controversy, kept his meddling in other countries’ affairs out of public view, and sometimes concealed outright the most unsavory aspects of his presidency. In the 1950s, Americans for the most part were content with this kind of leadership. The man who had defeated the Nazis helped guide them safely through the early Cold War. But more than a few citizens could see that Eisenhower also allowed right-wing demagoguery to fester, the civil rights struggle to suffer, the problems of the inner city to languish, and the conundrums of the superpower rivalry to remain acute and unresolved. It was in part because these Americans saw what Eisenhower had wrought during his two terms that in the ensuing years they decided, with all due respect, that they wanted something different. David Greenberg, a contributing editor to The New Republic, teaches history at Rutgers University and is at work on a history of presidents and spin.This article appeared in the May 24, 2012 issue of the magazine.